Get up to 60% Off on summer appliances such as fans, air conditioners, coolers, and more. Also, get an additional 15% discount when using your Bank Of Baroda card to pay. Get 15% Instant Discount Using Bank Of Baroda Credit Cards. Applicable on the Snapdeal website,mobile site & app. Valid for Bank Of Baroda card users only. Maximum discount available per card per month - Rs 3000. EMIs are calculated at an interest rate of 12% for 3 & 6 months tenure, 13% for 9 & 12 months tenure, 15% for 18 & 24 months tenure (% per annum on reducing balance). No Processing Fee for EMI facility. Find amazing combos at affordable prices only at Snapdeal. Activate this deal and take away amazing combos and outstanding price. Coupon code is not required to avail this offer. Also, get 10% Off on Bank Of Baroda Credit Cards. This offer is applicable on fashion, home essentials and daily essentials. The biggest international brands are listed in this sale. 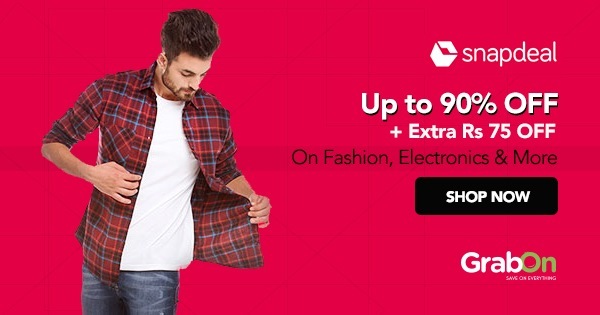 Get up to 80% Off on over 10 Lakh products for men, women, and kids. Get up to 50% Off on inverters at Snapdeal. Starting from just Rs 2000. Choose from various brands like Exide, Microtek, Sukam, Luminous, and many more. Get up to 70% Off on pet products at Snapdeal. Also get an additional 10% Off when paying through your Bank Of Baroda credit card. Choose from supplies for various animals such as dogs, cats, fish, birds, etc. Shop for sports & fitness products on Snapdeal and get up to 70% Off. Also, get an additional 15% Off when using your Bank Of Baroda credit card to pay. Snapdeal beauty sale - Get up to 70% off on Oriflame, Avlon, Loreal, Lakme and many more brands. You can also avail extra 15% off on your shopping by using your Bank Of Baroda credit card. Get up to 70% Off on a wide variety of products such as fashion, electronics, home appliances, accessories, grooming, nutrition, and much more. Also get up to 15% extra discount when using your Bank Of Baroda credit cards to pay. Shop at Snapdeal using HDFC Bank Debit/Credit Card and get 5% instant discount + 10X rewards on Snapdeal. Get 10% Discount every Friday, and 5% every other day. Offer valid for HDFC debit/credit card users only. Maximum discount - Rs 500. Get up to 65% Off on herbal gulal, colors, pichkaris, balloons, sweets, dry fruits, and much more. Also, get an additional 5% discount when paying using your HDFC card. Snapdeal is a leading e-commerce portal in India. It is a buzz for providing an array of exciting deals on a huge lineage of products. Quick, Simple and Great Savings – are the words that resonate with this merchant. It is a savings-focused website offering a wide range of enticing deals to 20 Million users nationwide. The products are descriptive and the shipping is easy, they stick to their strength of delivering to over 4000 plus cities and towns for over 6000 featured brands. Snapdeal shopping is one of the largest online platforms in India that ensure their customers enjoy the convenience of home shopping and so presents a large number of products. All the team members at the Snapdeal online commerce giant are committed to delivering the best shopping experience to the Indian market and to their users. From launching new gadgets and electronics every year, they do also provide exclusive sales on various product categories like apparel, appliances, home kitchen, e-Learning, toys, automotive and much more. Let's take a peek at how this store is best in the e-commerce stack up. Easy information access: With over 4 million listed products at their store, the Snapdeal team ensures customers have information about each product in-store. The store has listed out every product's features and descriptions on their website. Pre-ordering benefits: The customers can pre-order a product (be it a gadget, automobiles or anything), and get alerts via email or mobile phone about the various Snapdeal offers, and place an order at a reduced price point. Their mobile alerts and discount alerts are sure to help consumers grab massive savings on Snapdeal online shopping. All the Snapdeal sales arrive with the most enticing deals and with much scope to savings, which are seen in every category, be it the latest mobile or innovative gadget -- their savings add a new dimension to online shopping. Seamless shopping experience: With the perfect placement of products, Snapdeal codes, offers and more, the website is crafted beautifully in a manner to make the users’ online shopping journey comfortable. Ability to help people comprehend better: Theirs is the first e-commerce to have the multilingual feature. The additional two languages that they offer are Hindi and Tamil. Snapdeal provides offers for bank credit and debit card users as well as mobile wallet users. This offer is valid only for wallets like Freecharge, Mobikwik, Airtel, PayU, PayZapp and Paytm. The offers can be used when placing an order online through Snapdeal. Check out the Snapdeal credit card offers before placing your order. i) HDFC Offer: Avail great deals and offers on HDFC net banking. Use the HDFC offer and save big on your expenses. Buy quality products at affordable rates using Snapdeal coupons. Where to get the latest Snapdeal voucher for HDFC users? Look no further. Get all the latest and updated deals right here on this page. iii) Standard Chartered Bank Offer: Shoppers can pay via net banking and enjoy attractive offers. Get all of the hottest deals and offers right here. You can benefit from weekly and daily deals like the Snapdeal offer for Tuesday. You can avail several other offers on ICICI bank credit and debit cards. iv) SBI Offer: Users can avail special offers and discounts while shopping for groceries using their bank credit or debit card. Check out for the offers on SBI Cards before you place your order on Snapdeal. Are you fond of watches or know someone who is crazy about wrist watches? Get quality, stylish products for yourself or gift someone special, that too at unbelievable prices with Snapdeal today offers on watches. Not big on watches? Worry not, Snapdeal has plenty to choose and pick from. Whether you want to buy a brand new mobile phone or exchange your older phone for a new one. With Snapdeal mobile offers and mobile exchange offer, India has experienced a wonderful paradigm shift in terms of the online marketplace scenario. Whatever be your pick, Snapdeal coupons and offers can help you save on your online shopping journey. Are you big on electronics or are you thinking of getting a DSLR camera? Don’t forget to save big while shopping for electronic items with Snapdeal electronics offer. Check out the cool Snapdeal camera offers and get the best price on the camera and memory cards. The only thing that you need to be aware of is the latest and the best offer, deal or discount on the block. With incentives like Snapdeal offer of the day, you’ re literally spoiled with options to choose from. And it’s not like you have big offers only on specific days, you can avail discounts and offers pretty much every day. Shop today with discount offers on online shopping using Snapdeal. Whether you’re looking for smartphones or just some regular shopping on a weekday, you can always use Snapdeal mobile phone offers and other offers at Snapdeal to make sure that you get the right product at just the right price. Shop now with Snapdeal today offers! Every day is a big savings day when you use Snapdeal. The offers on Snapdeal for today aren’t any less special than those lined up for specific events like Snapdeal new year offers and special offers targeted towards a specific festivity. Apart from these special events, there are daily and weekly offers as well i.e. special offers for particular days like the Snapdeal Sunday offer. Worried that you’ re going to miss out on all these awesome deals and discounts? Well, worry not, we at GrabOn have gathered all the best deals you can possibly find right here. Be it Snapdeal latest offers on new launches, we’ 've got your back. Whenever you’ re buying something online, anything is it fashion, footwear, mobile phones, electronic gadgets or kitchen appliances make sure you use the Snapdeal online shopping offers to avail more savings. Now, you can shop more without burning a hole in your wallet. Psst. The Snapdeal Sale Is Here. Want to make the most of the Snapdeal unbox sale? Or just don’t want to miss on the Snapdeal sale season? Get your wish list sorted and buy all of the stuff on it without shelling out big bucks. Get huge discounts and crazy Snapdeal latest offers on various categories like fashion, electronics, footwear and much more. Celebrate with Snapdeal and get up to 80% OFF on products of the above-mentioned categories. Are you an HDFC bank credit card holder or do you use AXIS Bank credit or debit cards? Then, you can avail an extra 10% instant discount upon purchasing through the said cards. From handheld luggage to ethnic wear, running shoes, power banks, and chimneys save big on all products with Snapdeal festive sale promo codes. Snapdeal will help you unlock your long-forgotten passion. Always wanted to be the lead guitarist for your own band? Feel like you were born to be a cricketer? Well, what are you waiting for? You know what they say about ‘it’s never too late&rsquo. It’s actually true! Order yourself a six string or an English willow and rekindle the flames. Unbox your passion and breathe life into them. So, when does it begin? Snapdeal Unbox India sale happens every year. Wait till you hear about the amazing offers and products at a discounted price. Are you ready? Up to 50% off on electronic goods and mobile phones, 70% off on kitchen appliances and home/living supplies, 50% off on daily needs grocery and to top it all off up to 70% off on Men’s and Women’s fashion wear. Hyperventilating much? Don’t jump off the edge of your seats yet. Here’s a little something for the brand conscious person in you. World class and top brands the likes of Samsung, Apple, Xiaomi, Philips, JBL, Prestige, Micromax, voltas, LG, American Tourister, Vero Moda are on sale, just to name a few. Avail all the Snapdeal first purchase offer for today and discounts and if you worry missing out on any, check back here on GrabOn. There’s plenty of good news coming your way if you’ re an HDFC Bank Credit Card holder - you can avail 15% instant discount on purchasing a product through the Snapdeal Unbox India Sale! You will find an extensive collection of product deals, latest discounts here at GrabOn website, India’s #1 site to find deep discounts across various categories. What are you waiting for? Get ready to shop your long list of shopping with exclusive GrabOn Today's offer in Snapdeal. Great prices, fantastic selection of products with additional discounts are just one step away. How To Use Snapdeal Coupons On GrabOn?